In the Microsoft technology stack, the domain controller provides core identity services to your business network. As such, the loss of a domain controller can create a denial of service (DoS) and bring your network services to a grinding halt. I’ve identified three ways you can back up the System State of a Windows Server 2016 domain controller. The good news here is that the process hasn’t changed from Windows Server 2012 R2. What is the System State? Note: the following methods are presented no particular order. The following script will create a System State backup of the local server and save the backup to my F: data volume. You’ll notice that I’ve commented on every line so you can easily see what’s going on. NOTE: Here I focus only on backing up the System State. You can perform other file system (or even system image) backups on your servers. 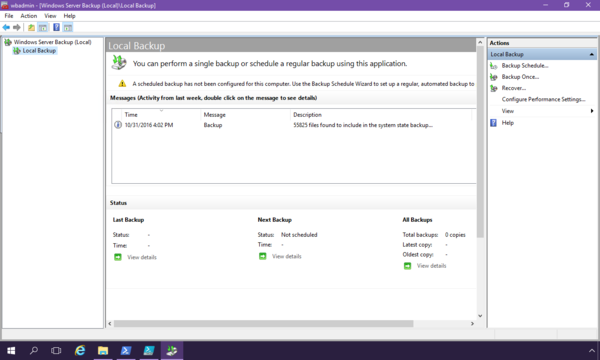 And, you can make use of such tools as Task Scheduler or AT.EXE to schedule your backups. $target = New-WBBackupTarget -VolumePath "F:"
If you’re not a PowerShell fan, then you may want to use the graphical backup utility that has shipped with Windows Server since the very beginning. Follow the procedure in the previous section (no escaping PowerShell completely, I’m afraid) to install the Windows Backup feature. You can then start the Windows Server Backup Microsoft Management Console, as shown in Figure 1. This procedure will work only if you have an Azure subscription. Then, the first thing you need to do is to log into the Azure Portal (portal.azure.com) and create a Recovery Services vault. Second, you create a Backup object inside your vault, as shown in Figure 3. 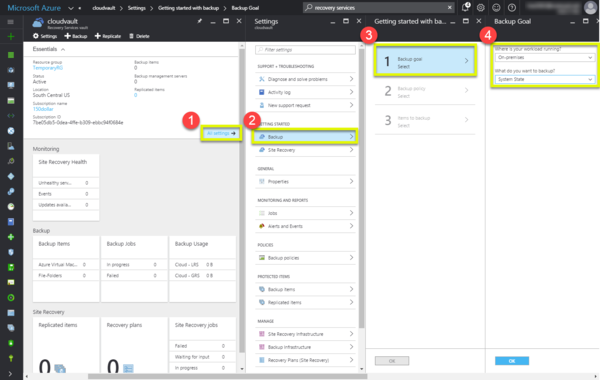 After specifying to Azure that you want to back up the System State of an on-premises virtual machine, you’ll be prompted to download and install the Microsoft Azure Backup agent. The bad news is that this „agent“ is actually a full-fledged server, based on Microsoft Data Protection Manager (DPM), whose download comprises 3.2 gigabytes and that requires a SQL Server instance for installation.